VersaLink ... versa what? Xerox VersaLink! Yes, we are going to have to get used to this new name for the new range of MFPs and printers that Xerox has just launched (February 2017). VersaLink is the new series of printing systems A4 color and monochrome developed by Fuji Xerox. The VersaLink C405 replaces the WorkCentre 6605; the B405 replaces the WorkCentre 3615; the VersaLink C400 printer replaces the Phaser 6600; and the B400 replaces the Phaser 3610. The color versions have a print speed of 35 ppm and the monochrome versions can run at up to 45 ppm. The color versions have a standard paper capacity of 700 sheets with options to take this up to 1,250, while the monochromes machines have a maximum capacity of 2,350 sheets. 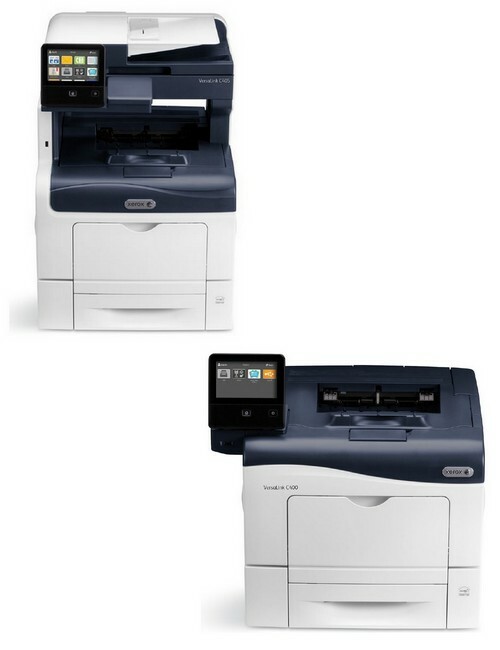 Note that the VersaLink C405 has a single-pass (dual-scanhead) document feeder which can hold 50 sheets, while the VersaLink B405 has an auto-reversing document feeder which can hold up to 60 originals. Available with a DN and N version (the N machines can only print on one side of a sheet of paper), these four machines are already present on the world market. Full customization by the user. The print controller, which is much more powerful than previous generations, is common to the entire VersaLink range. It has a 1.05 GHz processor, a maximum memory of 2048 MB, and an optional 320 GB hard disk for C405 and C400 and a 16 GB one for the B405 and B400. Optional Wi-Fi and Wi-Fi Direct connectivity is available across the range. As standard, compatibility with a wide range of mobile devices comes through support for AirPrint, Google Cloud Print and Mopria, and the Xerox plugin for Android is also available as standard. Find all the information and technical comparisons of these machines, as well as all their marketing documents on your DMO benchmark portal.